*NEW! * How to Earn Money Using Google Adwords - Master Resale Rights (MRR) ! How an Adwords campaign that costs $4.22 makes me $414.76 every month and how to replicate it in just 2 minutes. 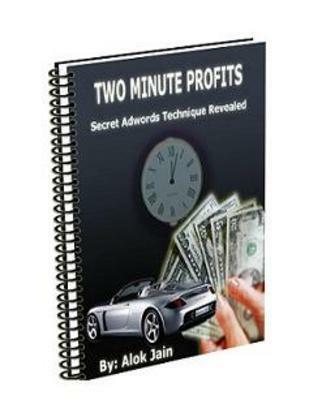 Glance over a few of the features of the *Two Minute Profits* system. * The system is almost risk free. You are not required to spend 100s of dollars on Adwords. In fact, even $10 will take you a long way. How To Succeed With Google AdWords takes you by the hand and leads you step-by-step through the process of building an intelligent and successful AdWords campaign. It teaches you *How to Beat the Learning Curve and Generate Instant Web Traffic with the World's Fastest Direct Marketing Machine*. In a nutshell it is an information packed ebook that explains how to achieve and maintain a constant #1 ranking on Google Adwords as well as how to get MILLIONS upon MILLIONS of dollars in *pay per clicks* for a cost of ZERO. Dont loose this opportunity grab it now! !